Building a new power plant in the U.S. is not for the risk-averse. The average cost of building one of these plants is historically 300% of the planned cost at the start of construction. Because of these prohibitive cost risks, as well as unfavorable public sentiment in reaction to the Three-Mile Island accident in 1979, U.S. nuclear power plant construction had ground to a halt for decades. Almost 30 years later, the first contracts for new plants were signed by a major U.S. nuclear power company in 2008. The total expected project cost for the three projects was over $30 billion. Hoping to avoid the abysmal track record of cost overruns in the industry, the nuclear power company wanted to use a new and improved risk-management approach to the planning process—so they hired Dr. Sola Talabi, Risk Management Professor at Carnegie Mellon University and Risk Management Consultant for Pittsburgh Technical, to serve as Nuclear Power Plant Risk Manager. “They knew what the history had been with these projects, and they didn’t want it to happen again,” says Dr. Talabi. In previous power plant construction projects, risk management was only an objective of project managers. This time, risk management was both an objective and a function; the company created a dedicated risk organization whose only role was to manage risk. Furthermore, the company switched from deterministic risk planning methods, to probabilistic methods—using @RISK. Armed with the software, Dr. Talabi and his risk management team were able to characterize the uncertainty associated with cost items and perform quantitative risk analysis using Monte Carlo simulation. They were also able perform a sensitivity analysis to identify key cost drivers, such as the fact that supply chain issues was the greatest risk driver of all. » Read the complete case study here. Statistician super-star and FiveThirtyEight editor Nate Silver has gained fame for his spot-on predictions around elections; he had accurate predictions for all 50 states during the 2012 presidential election. While it seems that Silver has the power of precognition, he actually relies on refined statistical methods—including weighting various political polls—to make predictive models. 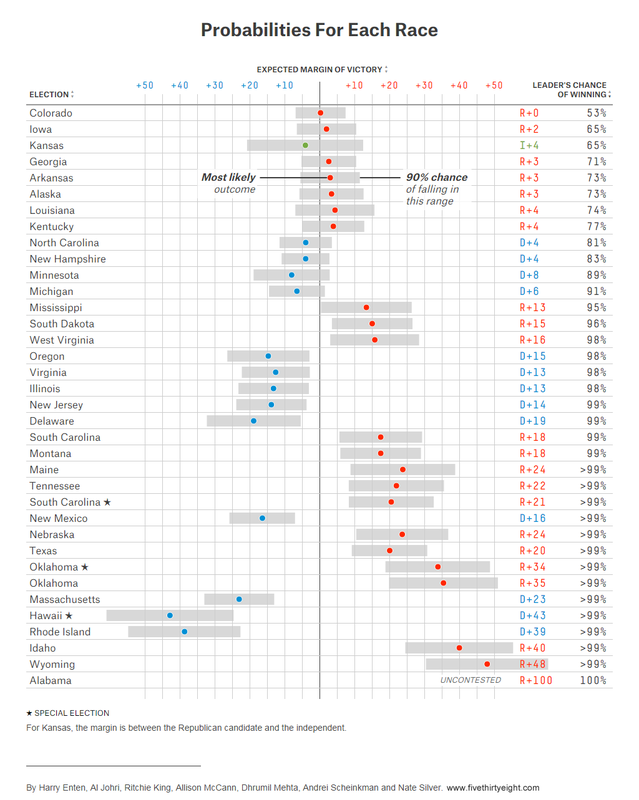 Recently, Silver and FiveThirtyEight put out a forecast for the 2014 Senate race which examines the races on a probabilistic basis. Silver’s analysis, which simply sums the probabilities of each side winning all its races, projects that the Democrats are slightly more likely to lose control of the chamber than to retain it. Lawrence W. Robinson, Professor of Operations Management at Cornell University’s Johnson Graduate School of Management took this research one step further by adding Monte Carlo simulation to the mix. Robinson set out to determine, in his words, “the probability that the Democrats hold at least 50 seats in the new Senate.” Only 50 seats are needed because Joe Biden will, in his role as president pro tempore of the Senate, break ties in the Democrats’ favor. “What we really want to know is, what chance will the Democrats have to retain control”? 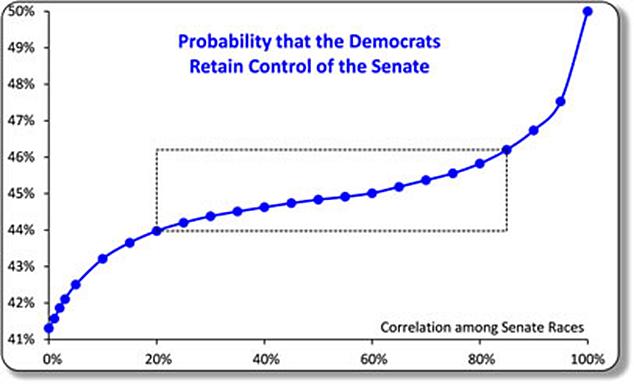 After using @RISK to crunch the numbers, Robinson found that the Democrats have only a 41% chance of retaining control of the Senate. While Silver warned in previous articles that to assume races are uncorrelated is “dubious,” and that Monte Carlo simulations requires variables to be uncorrelated, Robinson demonstrated that it’s in fact very possible to include correlation in Monte Carlo analyses. By creating a “lower bound” (zero correlation) and an “upper bound” (total correlation) Robinson showed that Democrats’ chances of retaining control only hovers somewhere between the aforementioned 41% and 50%. 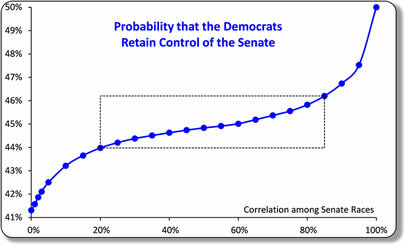 With the upper and lower bounds in place, Robinson went on to create a model that allows the coefficient of correlation between every pair of elections to vary between 0% and 100%, and found the probability that the Democrats will hold the Senate for each different correlation coefficient value. Stay tuned as the mid-term Senate race approaches this fall—Robinson plans to model more nuanced and data-rich predictions as the election nears. Palisade continues to garner broad media attention, this time due to the use of our software by a major helicopter manufacturer looking to better analyze risk when introducing new products. AgustaWestland, the European helicopter manufacturer, turned to @RISK to determine the financial feasibility of developing any new product, as detailed in our recent case study and blog. Since then, other publications have picked up the story, including Global Banking & Finance Review, a leading portal for financial news and opinions, Helihub, a data source for the helicopter industry, Bloomberg Business Week, IT News Online, and Gadget Rumours. The story features a Palisade case study on the helicopter manufacturer’s efforts to conduct risk analysis using Monte Carlo simulation to determine the accuracy of their forecasts, and in turn improve business, both in true feasibility and in financial results.